Crickets are a common insect in the Phoenix valley. Arizona is home to three abundant species of crickets: The house cricket (Achetea domesticus), the Tropical House Cricket (Gryllodes supplicans) and the Field Cricket (Gryllus spp). 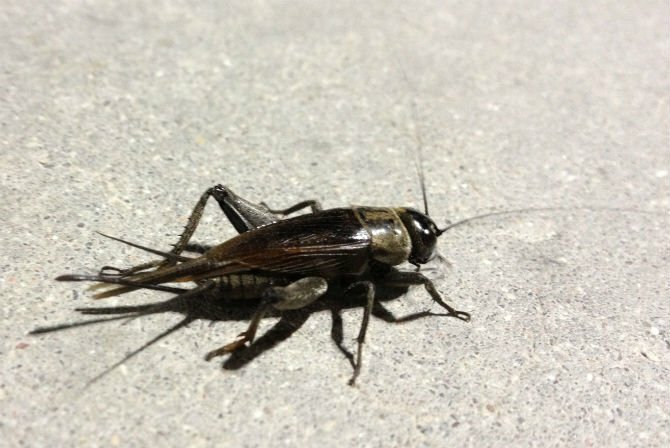 Crickets are known for their loud chirping sound. Many people consider crickets to be a nuisance, while others actually enjoy their song on a summer night. Crickets can get into your home but do not pose any direct harm to humans, pets, or cause any property damage. However, crickets are a tasty food source for scorpions. Cricket control is an important aspect of pest control and prevention in and around your home for this reason. Crickets are common insects that belong to the order Orthoptera. Insects in this order are known for their large jumping legs and include grasshoppers and katydids. Crickets prefer damp, shady spots and tend to hide during the day and come out at night. Crickets are generally considered to be more of a nuisance than a pest. Female crickets produce a large chirping noise to attract a male mate, and this noise can become irritating to some people. The three types of crickets common in the Phoenix valley vary greatly in appearance. The Field cricket is a dark brown or black insect with large jumping legs lined with prominent spurs. The house cricket is a much lighter color, almost tan, and has less prominent spurs on its jumping leg. The Tropical house cricket is similar in color to the house cricket, but the males have shorter wings and the females are wingless. Crickets are harmless to humans and are not known to do significant damage to belongings and structures. However, in Arizona, crickets on your property can attract other, more dangerous pests. Crickets are a common food source for scorpions and spiders. Whenever a food source is present near your home or in your home, you are at increased risk of attracting other pests. In fact, when we are called to a home for scorpion control, one of the first things we do is reduce the cricket population around a home. Scorpions can be a dangerous pest, and the Arizona Bark Scorpion’s sting can be possibly life threatening. Removing crickets from your property will help avoid turning your yard into a buffet line. Crickets enter homes looking for cool, damp places to hide and food sources. The best preventative measure you can take to keep crickets out is to seal any openings or cracks to the outdoors, especially near ground level. Start by checking the seals at doors to the outside of your home. You can also ensure that screens on your windows and doors are intact and fit correctly. Crickets can dry out in Arizona’s dry warm climate if not hiding during daylight hours. They require damp and shady hideouts. Crickets can be found hiding in stacked firewood, near the foundation of homes, in piles of rock, and in other damp places at ground level. Remove these common hideouts from around your home to make your property less attactive to them. Give us a call and we can provide you with a plan to make your home inhospitable to crickets. At Blue Sky Pest Control, we use a flushing agent to break down any crickets nests we find. We also use a truck mounted power sprayer to provide an effective barrier around your home to keep crickets from finding new hiding spots once their nests are destroyed. A routine pest control service along with the preventative measures mentioned above can significantly lower the number of crickets near your home.